Baldwin; Chambers; Choctaw (that area south of AL Hwy. 10 and west of AL Hwy. 17 and north of County Rd. 18 from AL Hwy. 17 to County Rd. 14 then north of County Rd. 14 to the Mississippi state line); Colbert (that area inside the following boundaries: from the intersection of the Natchez Trace Parkway and US Hwy. 72 west along US Hwy. 72 to the Mississippi State line, north along the Mississippi State line to the Tennessee River, east along the Tennessee River to the intersection of the Natchez Trace Parkway, south along the Natchez Trace Parkway to the intersection of US Hwy. 72); Coosa; Covington (north of US Hwy. 84); Elmore (that area inside the following boundaries: from the Coosa County/Elmore County line at the east bank of Lake Jordan, to AL Hwy. 9, south along AL Hwy. 9 to the intersection of US Hwy. 231, south along US Hwy. 231 to the intersection of AL Hwy. 14, west along AL Hwy. 14 to the east bank of the Coosa River, north along the east bank of the Coosa River to Lake Jordan, back to the Coosa County/Elmore County line); Geneva; Henry; Macon (that area inside the following boundaries: from County Rd. 24 at the Lee County line, west and south to County Rd. 26, west to County Rd. 10, southeast to County Rd. 5, south to County Rd. 47, south to County Rd. 2, east to the Russell County line); Marengo; Monroe; Pickens (north of US Hwy. 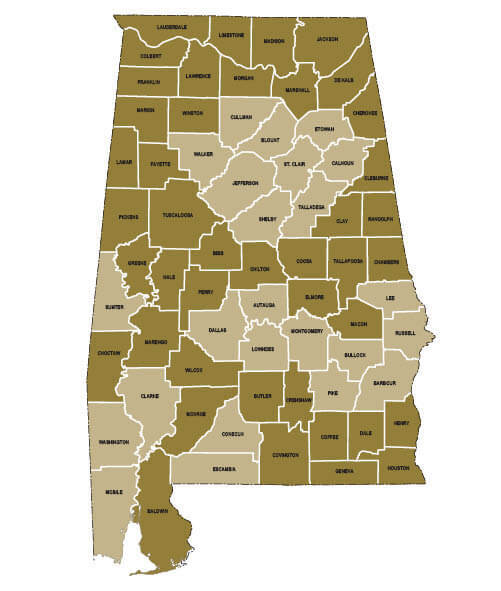 82); Tallapoosa and Wilcox counties. Individual property owners in Chambers and Coosa counties may hunt with dogs on their own property without special permit. No dog deer hunting allowed on Open Permit-Public Land (see 220-2-.85). U.S. Corp of Engineers Lands in Chambers, Greene; Pickens; Randolph and Sumter counties special muzzleloader and air rifle and unantlered deer season same as privately owned or leased lands in those counties. 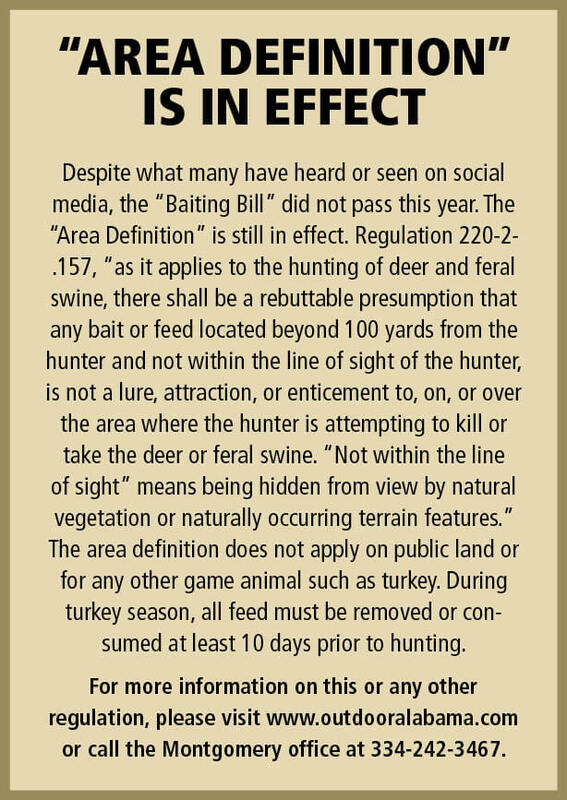 Be aware to consult U.S. Army Corps of Engineers (USACE) regulations regarding hunting activities and boat ramp use prior to hunting USACE regulated areas. Special Permits from the USACE may be required and some USACE areas are closed to hunting. For complete information concerning hunting on the Tennessee Tombigbee Waterway (TTWW), visit the website at http://www.sam.usace.army.mil/Missions/Civil-Works/Recreation/TennesseeTombigbee-Waterway/ or contact the TTWW office at (662 )327-2142. U. S. FOREST SERVICE (USFS): (same as open permit for county), except Wildlife Mgmt. Areas – one deer per day. Stalk Hunting Only – No Dogs (except for USFS Lands within Calhoun, Clay & Talladega counties): Same season and dates as open permit-public lands. Dog Deer Hunting – Calhoun, Clay & Talladega counties during the Dog Deer Season on open permit-public lands – Antlered bucks only; on Thursdays and Fridays until 2:00 p.m.; on weekends during legal shooting hours. No Dog Deer hunting on Monday, Tuesday or Wednesday of each week unless a holiday falls on those days; No Dog Deer hunting on the Piney Woods/Ivory Mountain Area, the borders of which are defined as: bounded by the Cleburne County line to the north running east and west, then to the west by Clay CR 3 running south to State Rte. 49; The south border is Clay CR 66 running east and west from State Rte. 49 to Hwy. 9; The eastern border is Hwy. 9 running north from Clay CR 66 to the Cleburne County line. These counties have areas where dog deer hunting is prohibited or restricted by special permit. Entire counties are open to dog deer hunting except for WMAs. See for exact details on dog deer areas.